Turron, which is pronounced Too-Rron, is bought and sliced into cubes and served on plates along with coffee or brandy, and typically given as a gift when visiting friends and family. In Ronda most supermarkets sell dozens of varieties of Turron, though the best quality Turron can be bought from the Campinas store in Plaza Socorro. It is also served at end of year Christmas parties, at any December fiesta such as the first puente (long weekend) of the month when Constitution Day and then the Feast of the Immaculate Conception are celebrated, or when friends and family come to visit after the Paseo to admire Ronda’s Christmas lights. Turron can be similar to nougat, though typically quite hard and chewy like toffee, so is quite different from the French variety. 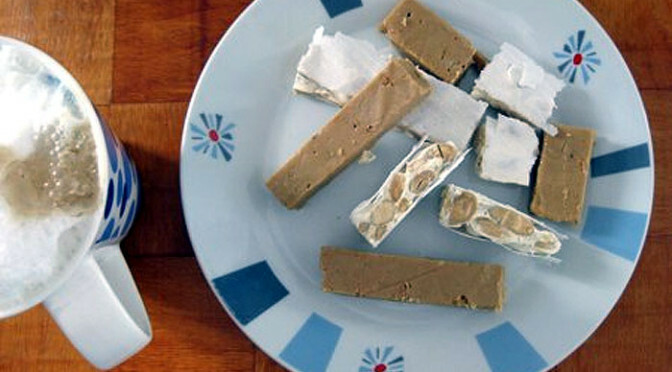 The two historic varieties of Turron are Turron Blando (soft) and Turron Duro (hard), and also originate in different towns, blando coming from Jijona in the Alicante province, whilst Duro emanates from Alicante city. Manufacturers in these two cities are allowed to use the official European “Denominacion de Origin” seal on their products. Eating Turron is an experience, and certainly Turron Blando is quite different from anything served in English speaking nations, though if you’re familiar with Turkish or Greek Halva you’ll have some idea of what it is like. Typically Turron Blando is a caramel colour, and supplied in blocks around 2cm thick. It is quite greasy and has a strong almond flavour, and has been likened to eating solid peanut butter, and shouldn’t be confused with other marzipan based treats that are also available during the Christmas holidays. Moorish settlers in Spain brought their original recipe for Turron from North Africa and the Middle East, though the two traditional Spanish varieties are largely a homegrown recipe, blando being a favourite delicacy of the Emirs of Córdoba during the time of Al-Andalus, whilst the Duro variety seems to have found more favour amongst the merchant classes in later Grenadine years. Historically Turron was made only with honey, almonds, and egg white, though in the 18th and 19th centuries the variety of ingredients increased dramatically, and now chocolate, coconut, jellies, tropical fruits and other confectionary can be added and will still be sold as Turron. Chop the almonds and then grind them in a mortar until a thick paste is formed, mix with the sugar using a wooden spoon, then add the honey and simmer over a low heat, adding the egg white only when the almonds, sugar, and honey have mixed. Continue to stir on a low heat for another ten minutes or until the mixture browns and thickens. Then pour into a flat tray lined with wax paper. Place another sheet of wax paper over the top and gently roll out until the mixture is evenly flat. Allow to cool, then cut into slices. This Turron Blando recipe will remain fresh for 3-4 days in an airtight container.